Advertiser.ie - Is State funding ruining the arts? Is State funding ruining the arts? 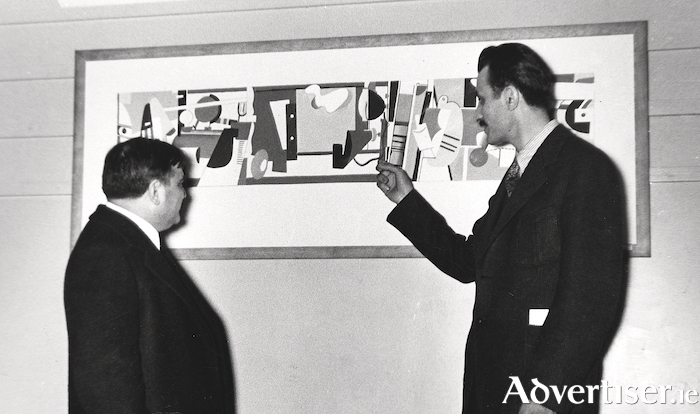 The artist Arshile Gorky having to explain his work to American politician Fiorello La Guardia at the opening of the Federal Art Gallery in 1935. “There is a certain element that one is a philistine if one questions it,” so said a Galway TD, and former member of the Galway City Council, at a recent meeting of the Dáil’s Public Accounts Committee. The topic under discussion was the huge amount of State money - €8.4 million – spent on the Pálás project – before the building was handed to a private company to run on a for profit basis for the next quarter of a century, at the end of which time Insider fully expects to be installed in the New Cemetery in Bohermore alongside Lord Haw Haw. Like Knock Airport, Pálás was brought to fruition – if indeed fruition this is – by a combination of bluff and ego. Although, to be fair, at least Knock Airport was not handed, on its opening, to a private company, for its first 25 years. As the aforementioned Dáil deputy implied at the PAC, many politicians do not have a clue about the arts, and some of those who do, such as Uachtarán na hÉireann, Michael D.Higgins, when he was a TD, would write letters and sign petitions in support of any bit of nonsense going. The Niall Stokes Centre for Creative Non Fiction; the Madge from Neighbours International School for Thespians; the Charlie Tex Watson Global Institute for Guitar Based Folk Music. Prominent politicians – who are meant to be adults – have signed letters and given solemn guarantees to support arts projects every bit as ridiculous as these parodies. Not because they believe the project in question is a good idea, but because, a ) the person asking for their support is one of the circle of sacred cows (of both genders ) who tend to rise to the top of arts administration and stay there, like heavily clotted cream, or b ) they believe the arts ‘innovator’ in question is a deranged lunatic, who in the old days would be detained permanently in Ballinasloe, and will sign anything in the hope they will never have to speak to this eejit again. It never works of course; the mad eejit always comes back. All of this drains resources, support, and energy away from real arts projects at a grassroots level, which is where the vast majority of the interesting new things happen. A more serious drain on resources is the way a small number of administrators tend to sit on top of the arts like an enormous, and very hungry, animal. After the decade of austerity many arts buildings are in quite a poor state of repair - windows which sometimes let the rain in; doorbells that never work; bathrooms that increasingly call to mind the public toilets of the 1980s. Yet the salaries of top administrators have, generally speaking, been protected, despite the fact that, sometimes, things run far more smoothly on a day said highly paid administrative genius does not turn up. Most arts project – be they literary, visual, or musical – typically begin when a group of enthusiasts coalesce together around a common idea, with no money, but lots of ideas. Obviously money is needed to make some things happen, and, especially, to ensure they keep happening; for man, or woman, cannot dine on enthusiasm alone. At the beginning there are no administrators. They arrive, usually by taxi, when the project is well established and everyone, including the Mayor and Rector of the local Anglican church, agrees what a fabulous thing it is that they are doing. Arts administrators tend to come in two essential types. There are those who maintain their power base by talking ráiméis to the more desperate end of the artistic community (mostly balding poets or coked up interpretative dancers ) in pubs that used to be interesting 35 years ago. These people could never do any other job. So, until they die which, given the amount such people tend to drink, will probably be quite soon, they must move from one arts administration job to the next, all the time making sure that, though the door handles may come off and the radiators leak, the administrator will be paid always and paid best. Such people tend, in the words of George Orwell, to a have a history of non-conformism behind them; are the sort who were a Maoist for half an hour in the Seventies but now think Brendan Howlin has some great ideas. Most of these people should be humanely retired, perhaps to a home for clapped out arts administrators, like the home for retired priests to which Jack was sent in one episode of Father Ted. This would, without the Government spending one extra cent, give the budgets of many arts organisations a major boost, as the money currently spent on these people’s salaries could be used for more productive purposes. Such a redirection of resources would necessitate the introduction of a radical, artist based, grassroots democracy in the arts. The boards of arts organisations contain many good people; but they also contain a good number of clowns and sycophants. We need to find a way of ensuring money goes to the best projects, run by the best people, and the practice of finding buildings for otherwise unemployable arts administrators to hide away in should be ended. Such an artist-based, grassroots, democracy would also serve the broad community of artists well in resisting, as they will eventually have to, the other type of increasingly prevalent arts administrator; those who really do see themselves as the literary wing of Leo Varadkar and PermanentTSB. One of Ireland’s leading literature organisations recently appointed a member of the board of Allied Irish Bank to its own board; and launched an issue of itsliterary journal on All Ireland Poetry Day at the Dublin Stock Exchange. Perhaps next year, to raise the moral tone, they plan to launch their journal in a brothel! Such organisations are becoming remote from real artistic activity, and the people at the top, many of them, could just as easily be running toxic waste plants. Only an uprising of artists will help us rid the arts of the congealed lard of the past and ward off the ghost of corporate arts future. This is a version of a struggle artists always face and one that urgently needs re-fighting. Is Noel Grealish in danger of losing his seat? Can County Galway help Michael Fitzmaurice keep his seat? Flooding, a more regular feature these days? Page generated in 0.0897 seconds.